Earth Day Sale! Take 20% off full price items! * Use code “EARTH2019”. Plus, get free shipping sitewide! *Full details. 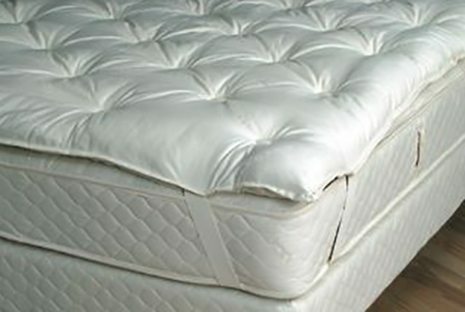 A lot of customers ask whether they should purchase a natural wool or a natural rubber/natural latex mattress topper (we use the terms natural latex topper and natural rubber topper interchangeably). While both styles of organic mattress topper will add an element of softness to your mattress, the feel that you gain from each is very different. A natural wool topper creates a feeling that is very similar to a traditional innerspring pillowtop, it has an enveloping quality and is very cozy. However, while a natural wool topper will add some softness if you have a mattress that is incredibly firm, it may not change the overall firmness of the mattress very much. In this instance we would recommend a natural latex topper, and preferably one that contains three inches of latex. Natural rubber mattress toppers will increase the softness of your mattress while providing both pressure relief and additional support. We feel that natural rubber toppers contour to your body without enveloping you as much as a wool topper will. They have a “spongier” feel as opposed to the “fluffier” feel of a wool topper. There are a couple of important points to be made about natural latex toppers. First, the type of latex and the firmness level contribute to the overall softness of the topper. Second, the amount of latex in the topper will have an effect on the feel of the topper. For instance, you will feel more of a difference in your overall mattress feel with a 3” soft natural Talalay topper than you will with a 2” soft Dunlop topper. If you are looking to completely transform the feel of your bed it is best to go with a 3″ natural latex topper. On the other hand if you are just looking to add a slightly different feel to the top of your mattress you could choose a thinner natural latex topper or wool topper. There are a couple of remaining points that should be considered when deciding which type of topper to choose. Natural wool toppers will compress over time due to the inherent nature of the wool batting. However, you can reduce compression of the wool and prolong the life of your topper by placing it in a large or commercial dryer on air fluff, as well as, frequently flipping and rotating it. In comparison, natural latex does not compress the way wool batting does. Natural latex returns to its original form when it is not in use and should maintain its shape for 10-20 years after the time of purchase. A mattress topper of any kind may not be the right choice if the mattress that it will be placed upon already has a significant dip. While the topper may provide a little extra comfort it will not disguise the existing problem. However, on a new mattress, or one in decent condition, natural mattress toppers can significantly reduce pressure points, add a softer feel to a mattress, and help keep the air clean!